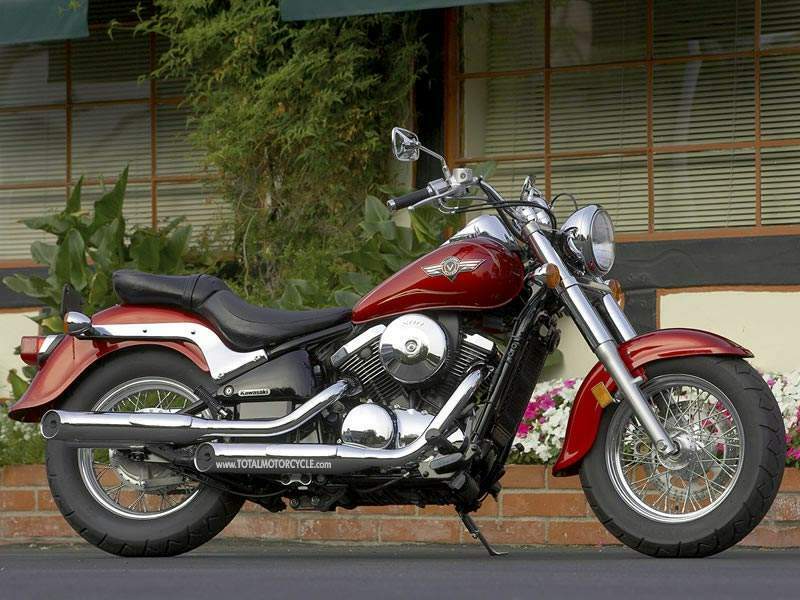 With the pulse of a 805cc V-twin engine, valanced fenders and chrome wire wheels, the Kawasaki Vulcan® 800 Classic motorcycle features the style and unlimited customizing potential of its 1500 Classic sibling. The heart of the Vulcan 800 Classic is the 805cc V-twin engine, which features a single-pin crankshaft and a gear-driven balancer to reduce vibration. Finned cylinders and four-valve heads are liquid cooled for optimum thermal control. Concealed automatic cam chain tensioners preserve the engine’s clean lines, while simultaneously allowing maintenance-free, precise cam timing. A spin-on oil filter also helps keep maintenance at a minimum. A 36mm Keihin carburetor equipped with an accelerator pump gives the Vulcan 800 Classic its quick throttle response. To take advantage of the engine’s broad torque curve, the five-speed transmission enhances the strong acceleration and creates a relaxed engine pace at highway speeds. The transmission also features Kawasaki’s exclusive Positive Neutral Finder, which simplifies finding neutral while at a standstill. The single-backbone, double-cradle frame gives the Vulcan 800 Classic stability at highway speeds and maneuverability on city streets. At the rear of the frame, a sleek, triangular steel swingarm and hidden Kawasaki UNI-TRAK® linkage rear suspension system provide a smooth ride while maintaining the look of a hard-tail cruiser. Up front, the 41mm fork aids handling and offers a wide stance for the classic cruiser look.